Low Back Pain, Numbness, Tingling, Carpal Tunnel Syndrome, Diabetes? "While early intervention and treatment can be critical to slowing the disease's progression, most Americans don't recognize neuropathy's symptoms, which include weakness, numbness, tingling and pain, especially in the hands and feet. If ignored, the symptoms can intensify to loss of sensation to unremitting pain. Neuropathy may be the most common disease in the United States that you've never heard of. Many are even unaware that they have it"
The Neurometer® CPT® procedure has been used for more than a million sensory nerve evalutions evaluations around the world. Over 800 peer-reviewed published scientific studies document the high sensitivity, specificity and reliability of the procedure. Read below to learn more about about the advantages of the painless Neurometer® CPT® procedure and why should be the first choice for patients concerned with nerve damage associated with diseases and injuries. Typical sensory nerves are comprised of three distinct subpopulations of nerve fibers as illustrated below. Each subpopulation is responsible for transmitting a different set of sensations. The smallest diameter and most numerous fibers (red) are the small unmyelinated fibers and transmit dull pain and temperature. 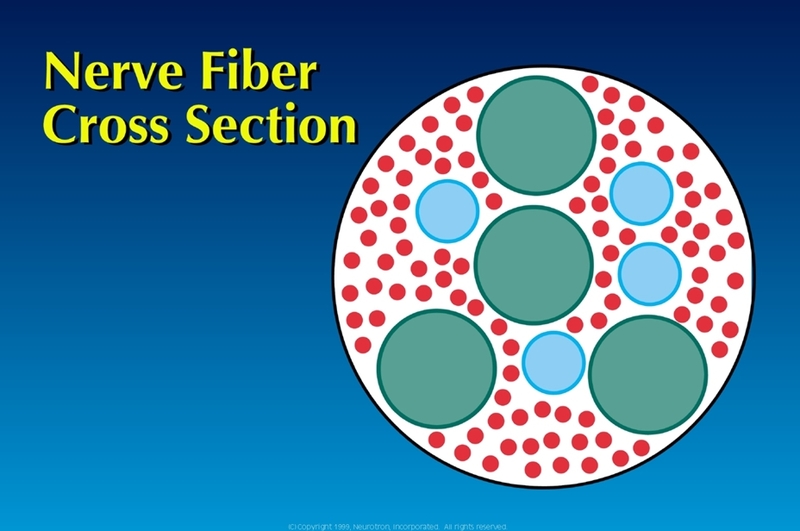 The middle size diameter fibers (blue) are the small myelinated fibers and transmit fast pain, temperature and pressure sensation. The largest diameter sensory nerve fibers (green) are the large myelinated fibers that transmit touch and pressure sensation. All three sub-populations of nerve fibers work together to transmit normal sensation. When one or more of those subpopulations are damaged it can result in various types of "painless" and "painful" nerve damage or neuropathy. The Neurometer® CPT® test is the only electrodiagnostic procedure able to painlessly evalute all three subpopulations of sensory nerve fibers allowing for the earliest detection of neuropathy. It's not uncommon for a disease or injury to initially damage one subpopulation of sensory nerve fibers while sparing the others until the disease progresses and the nerve damage becomes more profound. For instance, diabetic neuropathy generally appears first in the small unmyelinated fibers and it can be many months before any evidence of damage appears in the larger fibers. Early detection can be critical in the successful treatment of conditions causing neuropathy. The most common type of electrodiagnostic testing (sNCV), however, is blind small unmyelinated fiber damage which can result in a significant delay of treatment until the neuropathy becomes more severe. Only the Neurometer® painlessly tests all three subpopulations of sensory nerve fibers anywhere on the body allowing for the earliest possible intervention. Don't miss the opportunity to prevent serious sensory nerve damage because of out-dated and inefficient diagnostic tools. Don't let fear of pain and missed symptoms mislead a diagnosis. The Neurometer® painlessly detects functional impairments. This happens before a patient, before a doctor and before any other test - giving a heads-up for treatment and a lease on quality of life. Let today's medical and technological advantage work for you and your patients. Neurometer® testing recognizes pre-diabetic and diabetic nerve damage. Testing the longest nerve fibers in the body located at the tips of the toes permits the earliest detection. This enables early therapeutic intervention before damage is irreversible. Testing higher on the foot permits monitoring the earliest stages of recovery. The Neurometer® immediately detects and evaluates the difference between a neurological problem vs. muscular injury to the spine that occurs in motor vehicle accidents or other accidents. Find out if incidental MRI findings have any significance. Before any other test, the Neurometer® recognizes the presence of CTS and then provides electro-physiological confirmation of treatment efficacy and monitoring progress. Nerve damage associated with obesity is detected by the Neurometer® evaluation before it affects quality of life. The Neurometer® painlessly confirms nerve function with conditions such as Vulvodynia and Interstitial Cystitis. The Neurometer® accurately determines the effectiveness of dialysis therapy. Evaluations are conveniently conducted during dialysis. The Neurometer® picks up nerve damage before it's apparent to the patient or the clinician. The evaluation recognizes HIV polyneuropathy, provides painless diagnosis, evaluation and permits monitoring the efficacy of treatment.